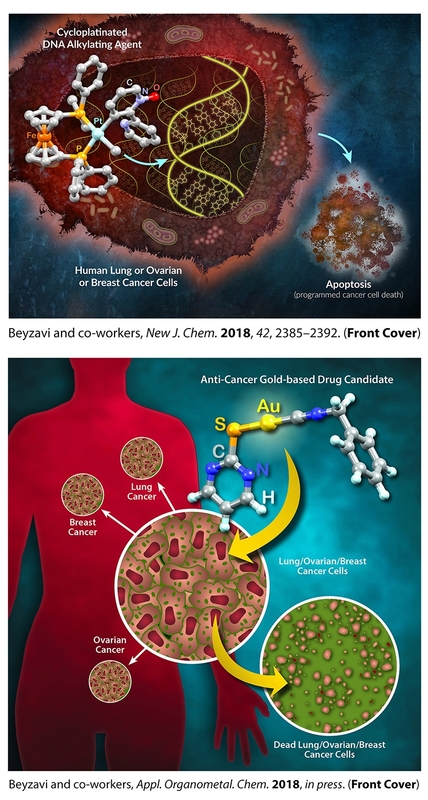 This images show a platinum-based molecule (top) and gold-based molecule (bottom) killing cancer cells. FAYETTEVILLE, Ark. – An international team of researchers led by Hassan Beyzavi of the University of Arkansas, is studying the use of platinum and gold to enable more effective forms of chemotherapy. Gold-based complexes are not currently used in commercial cancer therapies. Cisplatin, a platinum-based chemotherapy drug, is commercially available, but it has several drawbacks. Beyzavi, an assistant professor in the Department of Chemistry and Biochemistry at the University of Arkansas, explained that new platinum- and gold-based drug candidates could lead to therapies that are more effective and less prone to resistance than cisplatin, which means patients could take lower doses, minimizing the risk of side effects. He said that another goal of this research is to expand the scope of cancer cells that can be targetted. The researchers used computer simulations to design several different platinum-based molecular structures and test how these anti-cancer agents would bind to the DNA of cancer cells. To synthesize the new gold-based molecular complexes, the researchers used structures called ligands — groups of atoms which can be added to metals. They focused on two types, isocyanide and thiolate ligands. After the researchers had identified several promising molecular structures, Beyzavi synthesized the platinum and gold complexes. His collaborators then tested these drug candidates in the laboratory, exposing them to human lung, ovarian and breast cancer cell lines. Experimental results showed that these molecules were able to induce natural cell death by binding to the DNA of cancer cells. The researchers compared these new drug candidates to cisplatin and found that three of them were significantly more effective. The team recently published their findings in the New Journal of Chemistry and Applied Organometallic Chemistry. Their articles were featured on the cover of both journals.